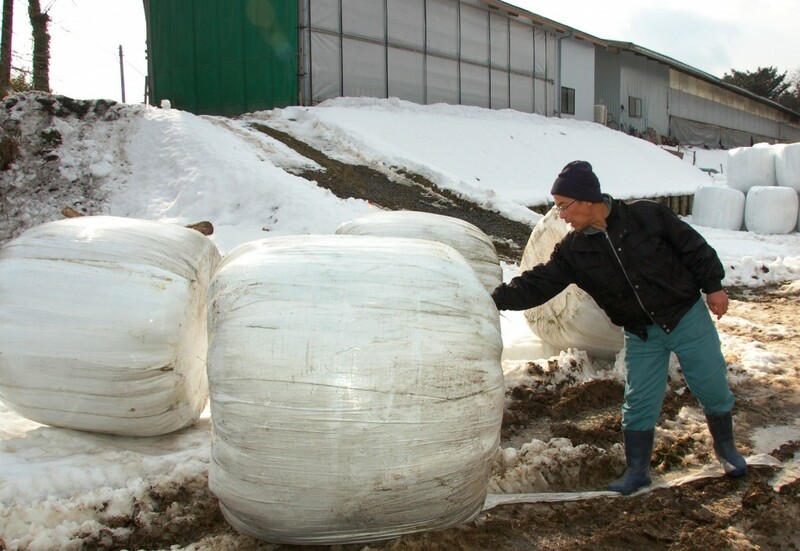 Hiroki Chiba, 57, a cattle breeder in Tome, Miyagi Prefecture who owns 60 Japanese breeding cows, keeps 50 rolls – weighing roughly 20 tons – of packaged pasture grass harvested in 2011 on a 50-are land next to his cowshed. The grass contains 8,000 becquerels or less per kilogram of radioactive fallout from the March 2011 triple meltdown at Tokyo Electric Power Co.’s Fukushima No. 1 nuclear power plant. Hiroki Chiba checking the condition of the grass rolls in Tome, Miyagi Prefecture. The grass rolls are estimated to weigh around 400 to 500 kilograms each. Each of the rolls gained at least 100 kilograms more weight while left out in the open, as rainwater sank into the grass through the deteriorated plastic wrapping. Chiba rewrapped the rolls in February in order to keep the rotten grass from flowing out, but a carrying machine dropped the rolls a number of times during the process because of their heaviness. Large machinery would be necessary to carry the rolls out of the farm, but Chiba says since the land used to be a cattle yard, the ground is too soft and it would be impossible to bring in heavy machinery unless he reinforces it such as by graveling. According to Iwate, Miyagi and Fukushima prefectural governments, radioactive-contaminated agricultural waste is estimated to total 203,650 tons, including 7,210 tons of rice straw, 52,950 tons of pasture grass, 55,130 tons of bed logs (data for Fukushima is unavailable although the amount is said to be considerably large), 5,300 tons of pruned fruit tree branches and 83,060 tons of compost. Most of the waste is kept in farmlands or temporary storage space. In Tome alone, there are some 1,500 tons of contaminated grass, 300 tons of compost and 2,700 tons of bed logs kept at farmlands, with no prospect of how to get rid of them even three years after the accident. Agricultural waste containing radioactive substances of 8,000 becquerels or less per kilogram is classified not as hazardous waste but as general waste under the law, which means municipal governments are responsible for disposing of them. However, national and local governments are busy playing hot potato with the issue of radioactive waste disposal. The Tome municipal government claims that the national and prefectural governments should take the lead in disposing of the waste, since all the municipalities are having difficulty obtaining residents’ approval to dispose of radioactive substances. Meanwhile, the Miyagi prefectural government is reluctant to cope with the issue, saying that the prefectural government cannot take any action unless the municipal governments show their intention to dispose of the waste. The Environment Ministry also maintains its stance that municipal governments bear primary responsibility in disposing of the waste. Even for so-called “designated waste” – hazardous waste containing over 8,000 becquerels per kilogram of radioactive substances, which the national government has the responsibility to dispose of, the plan to build a final disposal site is deadlocked. In January, the Environment Ministry selected Fukayamadake in the city of Kurihara, Shimohara in the town of Taiwa and Tashirodake in the town of Kami as the candidate sites for the final disposal of radioactive waste, and announced them at a meeting of representatives from all municipalities in Miyagi. Agricultural cooperatives in the areas, namely JA Kurikko, JA Asahina and JA Kami Yotsuba, submitted to the candidate municipalities request letters opposing the establishment of disposal sites. JA Kami Yotsuba chief Shizuya Miura, who initiated a campaign against the construction of a disposal site in Kami, warns that if the construction plan leads to harmful rumors, agriculture – the district’s main industry – will be devastated and the area will become a ghost town. Chiba also keeps 130 rolls of rice straw as designated waste in his greenhouse. Referring to campaigns against the construction of final disposal site, Chiba said he would feel the same way if he was told to accept radioactive waste from other districts. Farmers’ sufferings concerning radioactive waste continue to grow. Chiba says he would have quitted farming long before three years if he did not have the support of his family. “Have the government or Tokyo Electric Co. ever thought about the feelings of farmers who have to continue living in this place no matter how hard it is?” he says. This entry was posted in Food & Agriculture and tagged Feature. Bookmark the permalink.